Serwe with Marianne Sauvignon Blanc 2016. Everything that’s great about Thai food – aromatic and spicy. 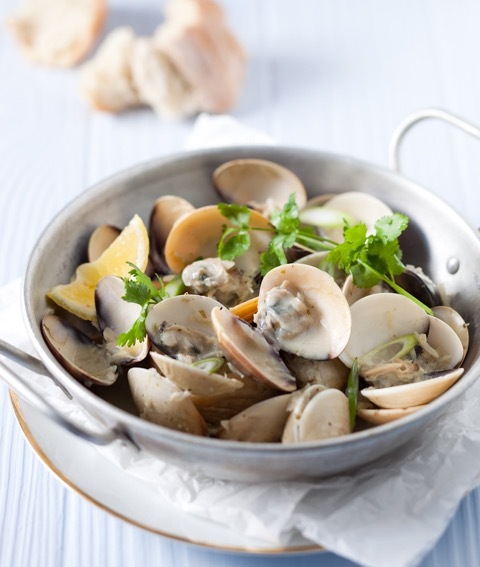 Place clams in a colander and rinse well under cold running water. Transfer clams to a bowl, cover with water and place in the fridge overnight allowing them to defrost and purge (to remove impurities and sand). Heat oil in a pot and sauté onion, garlic, lemongrass, ginger and chilli for a few minutes or until onions are translucent. Add curry paste and cook for a further minute to release the aromas. Increase heat, drain the clams and add them together with the wine and cover with a lid. Steam for about 8-10 minutes or until clams have opened. Discard any clams that have not opened during cooking. Pour in coconut cream and allow to heat through. Transfer clams to a serving bowl and pour over the sauce. Garnish with chopped coriander and spring onions and serve with crusty bread. Many might be inclined to opt for a Riesling with this dish but the intense and vibrant flavours will overwhelm most wines from this variety. Rather, opt for a Sauvignon Blanc with some weight which will play off well against the green curry.